Here is where you can LISTEN to the Faux-ditions for “Late Show with Stephen Colbert”. For the details on this completely fun event, check out this blog post. Entries are posted in the order in which they are received. Good luck to all and thanks for participating. Well today’s the day! Ladies and gentleman you are all invited to submit your faux-dition! For those who don’t know, the unofficial audition (or faux-dition) allows voice talents the opportunity to create a fake “audition” for a high profile (and non-existent) job opening. In other words…it’s all for fun and not for a real job. Here’s the unofficial auditions we did about 4 years ago for “The Price is Right”. My choice for which show to NOT audition for was an easy one for me. When the new “Late Show with Stephen Colbert” debuted, the show did not (and as of yet still does not) use a live announcer as David Letterman did and as Conan O’Brien and Jimmy Fallon do. Colbert himself read the pre-recorded intro in the first shows. This of course got me thinking about a possible new Faux-dition at the time. In more recent episodes, it sounds as if they have a regular announcer doing a pre-recorded intro over show titles. I can’t give the fellow any credit here with a shout-out because there seems to be no credit given to him on any web site. But, rest assured, he does does a perfectly satisfactory job. This faux-dition should not be seen as an indictment of him but rather just a way for the rest of us to have some harmless and unprofitable fun. As always this event is for fun (“this is not a competition, just an exhibition; please, no wagering”.) No one…but NO ONE who enters this phony audition event is in line for the announcing job on “Late Show with Stephen Colbert ” and no way is ANYONE associated with “Late Show with Stephen Colbert ” endorsing, condoning or otherwise support this announcing fantasy. They also own all the copyrights to name, music and everything else to do with the show. I make no money on this but merely am promoting one of the coolest VO jobs in our world. Let’s all dream a little together. I’ll grab 3 judges and we’ll whittle all the contestants down to 3 top finishers. You as the participating voice over talent are responsible for the mixing and audio quality (which has been a factor in past judging and voting); your audition needs to sound broadcast ready which means the mix should sound as great as your voice. If you want to be a pro you gotta sound like a pro…completely. Here’s my demo (just as an example – I’m not saying it’s good enough for broadcast but it is broadcast ready). Perform the announce in whatever way you think would be most likely accepted by “Late Show with Stephen Colbert” producers if they were auditioning you as a new announcer (which, as far as I know, they are not). Remember – although it is not – treat this like a real audition. Give us your best performance. * Download the script in PDF form HERE. Please note the timing notes on the script which you should try and follow as it matches the show’s timing with the opening credits. Do NOT deviate from this bed, do not create your own and do not substitute another version of music. There will be a lot of entries and the judges can’t listen to auditions of varying lengths because you think you can produce a better bed. the winner of the 2011 unofficial casting call for the price is right is…..
Congratulations to all the nominees, thank you to all the voters and sponsors….and good luck on that car battery, Brad! 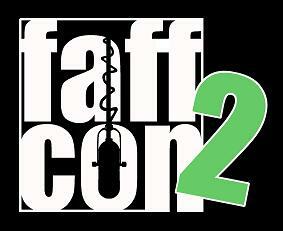 See you at Faffcon 2 in Atlanta! UPDATE: 1/23/11 5:00 p.m. ET – The voting is now CLOSED. The WINNER will receive one free registration to Faffcon 2 Electric Boogaloo â€“ The Voiceover Unconference, taking place in Atlanta, GA from February 25-27, 2011. The winner (who must be 18 years of age or older as of today’s date) is responsible for ALL other expenses involved in their participation in Faffcon 2 including but not limited to travel, lodging, taxes and bail money â€“ in case you enjoy yourself too much in Atlanta. The winner assumes all liability upon acceptance and execution of this prize and agrees to hold harmless the blog owner, the sponsors, Faffcon or anybody else associated with this Fauxdition or event. This prize is sponsored by: Bob Souer, Liz de Nesnera, Dave Courvoisier, Diane Maggipinto, Melissa Exelberth, Trish Basanyi, Natalie Stanfield Thomas, Amy Snively, Pam Tierney & Todd Ellis. Any moment now, the top secret international judging panel for the Unofficial Announcer Auditions for The Price Is Right will announce their top 5 finalists among all the entries. When they are announced, you’ll get to VOTE for your favorite. But be QUICK, the voting will close on SUNDAY, JANUARY 23, 2011 at 17:00 HRS ET. The winner, who will receive a registration to Faffcon 2 in Atlanta, will be announced HERE shortly after that. Stay tuned for the finalists!!!!!! faux-ditions time: unofficial voice over casting call for the price is right! Editor’s Note: If you don’t subscribe to this blog, you miss all the cool stuff like this faux-dition. Click here to subscribe. And please promote this via social media to all your VO pals. Thanks! You know how new products come out with a new version and say “It’s Better Than Ever!”? Well, with this year’s unofficial announcer’s audition (faux-dition), it’s true because we have one doozy of a prize for the winner. This year, I picked the most amazing announcer supported game show in the history of broadcasting for our unofficial casting call: “The Price Is Right”. A staple of CBS mornings since the late 1700’s, this perennial ratings winner has had only two daytime host in its modern version (Bob Barker and now Drew Carey) and three announcers: Johnny Olsen (my hero), from Buffalo’s Big 1520 WKBW Rod Roddy and most recently Rich Fields. But the show has been doing on-air auditions for a new announcer and so it seemed only fair that we collectively throw our fake hat into the ring for this great announcing job. As always this event is for fun (“this is not a competition, just an exhibition; please, no wagering”.) No one…but NO ONE who enters this phony audition event is in line for the announcing job on “The Price Is Right” and no way is ANYONE associated with “The Price Is Right” endorsing, condoning or otherwise support this annual announcing fantasy. They also own all the copyrights to name, music and everything else to do with the show. I make no money on this but merely am promoting one of the coolest VO jobs in our world. Let’s all dream a little together. I’ll grab 3 judges and we’ll whittle all the contestants down to 10 finalists and then we will vote (but not until I call the vote). Here’s my demo â€“ again just as an example â€“ perform the announce in whatever way you think would be most likely accepted by “The Price Is Right” producers if they were auditioning you as a new announcer (which, as far as I know, they are not). But here’s where the NEW & IMPROVED part comes in – the winner by votes will win a grand prize: a complimentary registration to Faffcon 2 Electric Boogaloo – The Voiceover Unconference, taking place in Atlanta, GA from February 25-27, 2011. The winner (who must be 18 years of age or older as of today’s date) is responsible for ALL other expenses involved in their participation in Faffcon 2 including but not limited to travel, lodging, taxes and bail money – in case you enjoy yourself too much in Atlanta. The idea with this prize is if you’re great enough to be judged to be the best in this forum, you should have the opportunity to learn with and among the best in our industry at Faffcon. There were a bunch of people who chipped in to support Faffcon and the spirit of this annual unofficial casting call and I am truly appreciative of help in creating a complimentary Faffcon registration including but not limited to (and in no particular order) Bob Souer, Liz de Nesnera, Dave Courvoisier, Diane Maggipinto, Melissa Exelberth, Trish Basanyi, Natalie Stanfield Thomas, Amy Snively, Pam Tierney & Todd Ellis. If I have forgotten anyone…please ping me. From the Bob Barker Studio at CBS in Hollywood! It’s The Price is Right! Mary Thomas! Come on down! Hugh Merriweather! Come on down! Clara Jones! Come on down! And Ben Smith! Come on down! You are the first four contestants on The Price Is Right! And now, here’s your host, Drew Carey!!!!! HERE is your music and sound effects bed (right click on the link and click “Save Link As” to save it to your computer). Do NOT deviate from this bed, do not create your own and do not substitute another version of music or sound effects. There will be a lot of entries and the judges can’t listen to auditions of varying lengths because you think you can produce a better bed. Email your audition to peter at audioconnell dot com. MP3 file only. I’ll allow submissions until it becomes tedious or boring so stay tuned. Only one entry per voice talent, please. Have fun and enjoy the ride. P.S. The script has been altered from its original form. This now contains the most updated script.